Noctua's DX line of coolers has become a default choice in high performance quiet cooling solutions for Intel Xeon CPUs. The latest i4 revision supports LGA2011 (both Square ILM and Narrow ILM), LGA1356 and LGA1366 based Xeon platforms and the 12cm model NH-U12DX i4 comes equipped with Noctua’s award-winning NF-F12 Focused Flow™ fan with PWM for automatic speed control. Due to its slim design, the NH-U12DX i4 now provides easy access to the memory slots and better compatibility with tall modules. Fitted with the professional SecuFirm2™ mounting system and bundled with Noctua's industrial-grade NT-H1 thermal compound, the NH-U12DX i4 forms a complete premium quality package for quietly cooling Xeon based workstations and servers. The NH-U12DX i4 is based on the latest version of Noctua's award-winning NH-U12 coolers. First introduced in 2005, the NH-U series has become a standard choice for premium quality quiet CPU coolers and won more than 400 awards and recommendations from leading international hardware websites and magazines. Thanks to its slim design with only 45mm fin depth, the NH-U12DX i4 ensures easy access to the RAM slots. When installed parallel to the slots, it will not overhang the memory on LGA1356, LGA1366 and LGA2011 Square ILM even with two fans installed, thus providing full compatibility with tall RAM heatsinks. 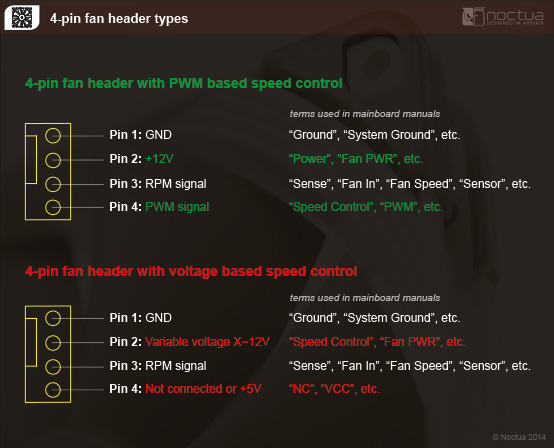 The NF-F12 120mm fan supplied with the NH-U12DX i4 supports PWM for convenient automatic speed control through the motherboard. In addition, the maximum fan speed can be reduced from 1500 to 1200rpm using the supplied Low-Noise Adaptor for even quieter operation. For users who want to achieve even better performance by adding a second, optional NF-F12 fan to create a push/pull setup, the NH-U12DX i4 includes fan clips and an extra set of custom-designed anti-vibration pads that allow to off-set the rear fan by 5mm to improve acoustics in dual-fan mode. Noctua's SecuFirm2™ mounting systems have become synonymous with quality, safety and ease of use. Supporting Intel's LGA2011 (both Square and Narrow ILM), LGA2066, LGA1356 and LGA1366 Xeon platforms, the SecuFirm2™ mounting included with the NH-U12DX i4 guarantees perfect contact pressure and maximum convenience on all sockets. Noctua products are renowned for their impeccable quality and outstanding longevity. Like all Noctua fans, the supplied NF-F12 features an MTTF rating of more than 150.000 hours and the entire NH-U12DX i4 package comes with a full 6-year manufacturer's warranty. Noctua NH-U12DX i4 лишен недостатков. Кулер прост в установке (процесс монтажа занимает меньше времени, чем в случае с любым универсальным продуктом от австрийского производителя), он дешевле мейнстрим СО, ориентированных на большее кол-во совместимых разъемов. Noctua işlemci soğutucuları ısı değerlerine göz attığımızda boyutlarına göre performans gösterdiklerini görüyoruz. Özellikle Noctua U12DX i4 testleri liderlikle bitirirken, D9DX ise testleri 3.üncü sırada bitirdi. Özellikle Noctua U12DX i4 işlemci soğutucusu işlemcimizi overclock yaptığımızda daha iyi performans gösterirken Thermalright Macho Zero ile başa baş sonuçlara imza atıyor. Kod overclockinga nismo koristili low noise adaptere nego smo mjerenja samo izvršili pri punim brzinama ventilatora. Rezultat nije nimalo loš kada je u pitanju veći U12DX hladnjak koji očito bolje funkcionira pod većim opterećenjem jer je ovdje za 3°C bolji od i32. U9DX s oba ventilatora i u punoj brzini drži procesor na iznimno vrućih maksimalno zabilježenih 95°C. Prosjek maksimalnih temperatura za U12DX iznosi 83.13°C, za U9DX 87.1°C, za i32 86.5°C i za D15 80.33°C. Maksimalna potrošnja sistema je iznosila 275 W.
Noctua NH-U12DX i4 продемонстрировал впечатляющие результаты и даже в абсолютно бесшумном режиме обошёл стандартные решения более, чем на 20 градусов! Кулер сочетает в себе исключительно лучшие качества и полностью оправдывает свою цену. Mind you that i included Liquid Cooling solutions(in the same price range) as well.None of the coolers obviously have any issue whatsoever in IDLE with the Intel Xeon E5-2687W not overclocked.The Noctua NH-U12DX i4 managed to outperform the Liquid Cooling solutions in load mode. Overall fine results. Noctua zeigt mit dem NH-U12DX i4 eindeutig, das Server und Workstations nicht laut sein müssen, um mit einem kühlen Kopf agieren zu können. Der NH-U12DX i4 setzt sich um Längen vor den BXSTS200C Kühler von Intel. Jedoch ist mit dem Noctua Kühler kein Betrieb in einem 2HE Server mehr möglich. Bei einem Einsatz in Workstation, welche meist in einem Desktop ähnlichen Case verbaut sind, kann der Kühler jedoch zeigen, was in ihm steckt. 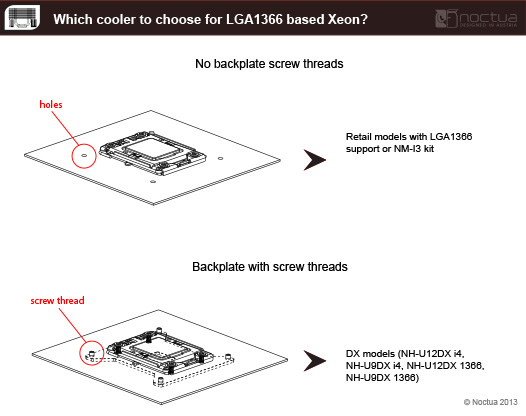 Does the mounting-system of the NH-U12DX i4/NH-D9DX i4 3U/NH-U9DX i4 support LGA2011 based Xeon platforms with Narrow ILM? 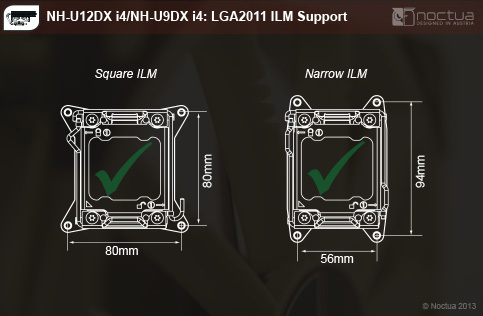 Can Noctua coolers be installed on LGA2011 Narrow ILM platforms? The NH-U12DX i4 and NH-U9DX i4 include mounting hardware for LGA2011 Narrow ILM. Other models are mechanically incompatible with the Narrow ILM mounting system and can thus not be used on this platform.